For years I've stuck to tradition when it comes to holiday meals. Every Christmas I make my Granny's Cauliflower Casserole and on Easters we host, I make her famous Napa Cabbage Salad. (My favorite desserts from my Granny on on the blog here.) For me, recipes are a way for me to honor the memory of loved ones lost, or loved ones we can't be with on the holiday. When I moved to Colorado, and then got married, perhaps the hardest adjustment for me, in both seasons, was the change of routine when it came to holidays. I'll admit it. I don't do well with change. But, when you get married and are figuring out your own routine and traditions, it seems like "change" is all you do. So you bend and realize the world isn't going to end just because it doesn't fit in your box anymore. I'm not saying you bend on everything. Brandon and I certainly have created our own dreams and plans that are non-negotiable, but when you are blending into a family, it's all about give and take. And, after 5 years of marriage, we've figured out a rhythm that works for us, while trying to honor what's important to both of our families. Brandon's family does Thanksgiving. It's their thing. In recent years, my family has just thrown something together last minute, and we would try to make appearances at both, but last year we just decided we aren't going to do that anymore. Since Brandon's mom always hosts Thanksgiving, we decided we would spend Thanksgiving day there. Christmas, on the other hand, is extremely important to my family. In fact, it's my dad's birthday, so obviously it makes sense we spend the day with them. Easter has been sort of all over the place with plans in recent years, but we have found a way to be with both families by either hosting or heading to brunch, together. I imagine as we get a bigger place, we will start to host that. That's the routine that's worked for us, recently. And, since we are forging a new path of traditions, it's the perfect way to start experimenting with new recipes, too. If you are heading to a Thanksgiving dinner or even a Friendsgiving, here are 5 easy and impressive Thanksgiving sides to take with you. 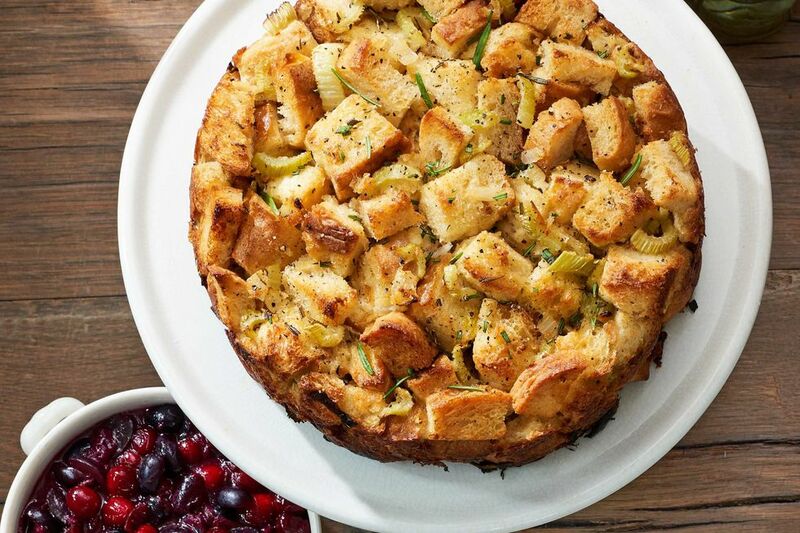 Rosemary Monkey Bread Stuffing - I mean...is there any better sentence on the planet? I'm totally hooked and dying to try this one. It's a modern twist on a traditional classic. You can't go wrong here. 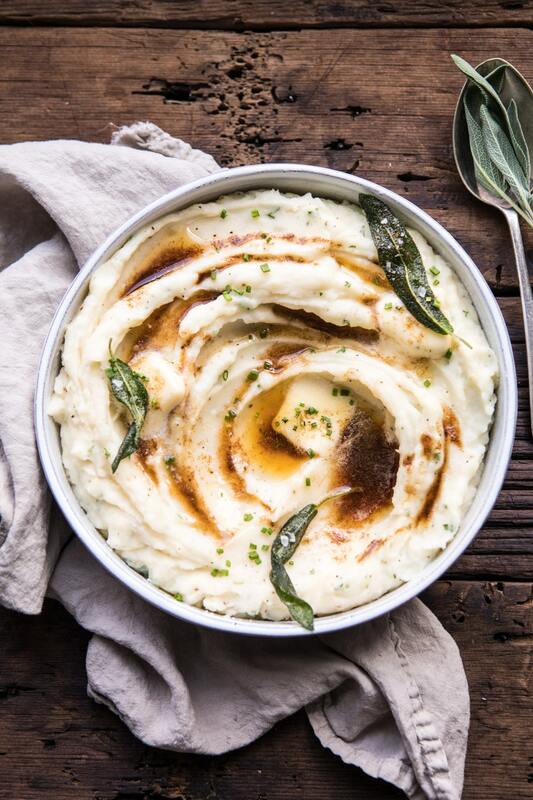 Buttery Herbed Mashed Potatoes - Everything Half Baked Harvest does is a win in my book, so I'm anxious to try these mashed potatoes. We are heading to a friendsgiving the day after Thanksgiving, and I signed up to bring potatoes and am going to try these. I'll let you know how they turn out. 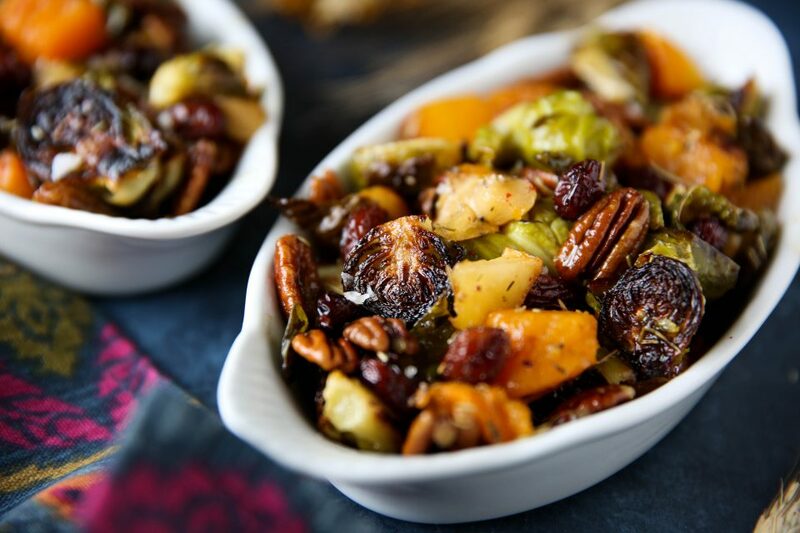 Maple Roasted Brussels Sprouts Butternut Squash - If you're hanging with a healthy bunch on Thanksgiving, you can't go wrong with my friend Julie's dish here. It's Paleo and absolutely delicious. I think I might make this as a side for my own dinner in the coming weeks. 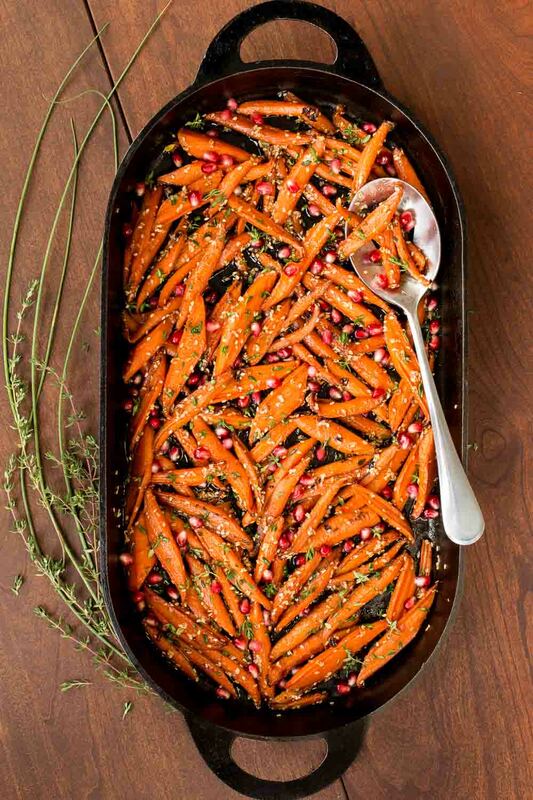 Honey Maple Roasted Carrots - Another healthyish and impressive side, sure to please. Someone brought roasted carrots a few years ago and they were a big hit. 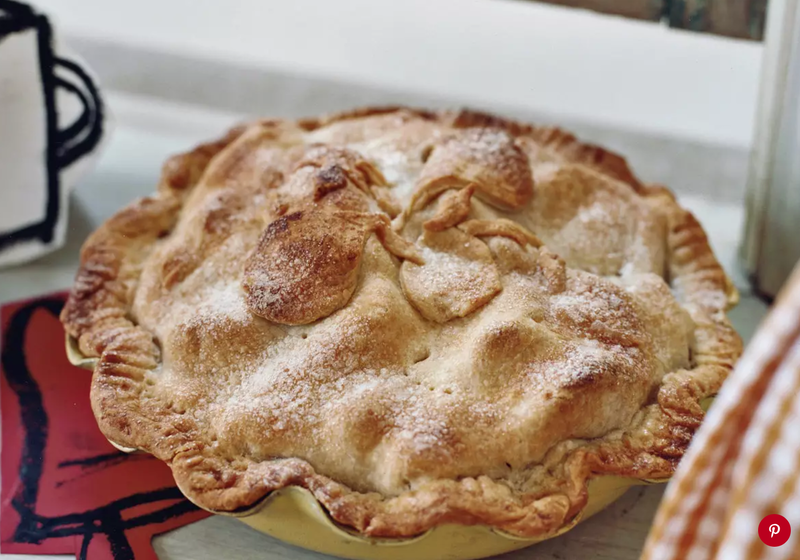 Pear Pie - I started making this back when we lived in California. It's like apple pie 2.0 if you ask me. What are some of your holiday traditions? How do you sort through sharing holidays as a married couple? And what are some of your favorite sides? Let me know in the comments below! I remember those first few years of marriage, it was hard for me to bend on my traditions. Now it just feels like second nature. I love these recipes you shared. I tend to make the same thing over and over again - but these all have a lovely elevated vibe, I need to try! Oh my good Lord, these all look and sound amazing!! Definitely going to try the brussel sprouts! oh my, these pictures and descriptions sound soooo good! I love the butternut squash, bussel sprouts mix and those carrots. Well it all looks good! These are amazing hearty recipes dear! Will check these out, thanks for sharing!